Dar es Salaam — Overdependence on rains tellingly annoys Ms Eda Chibuti, a smallholder vegetable farmer in Chamwino District. "Had we had enough dams to water our farms, we could have grown more vegetables for sale to earn money," she says. "If this happens and the money reaches us, [then] our living standards will improve considerably. It's all we are asking for." Many share Ms Chibuti's concern about the government failure to allocate 10 per cent of the national budget to agriculture. A petition demanding East African Community (EAC) member states to make it legal requirement to allocate and disburse the ten per cent of their national budgets to the sector is circulating. ESAFF is a network of grassroots small-scale farmers' organisations working in 15 countries of Eastern and Southern Africa. This commitment notwithstanding, the situation on the ground is as unsatisfactory as it is disappointing. Statistics show that in 2015 only Burundi and Rwanda met the 10 per cent target for their agriculture expenditure. In 2016, Burundi agriculture budget was 14.22 per cent of the national budget, Kenya 2.4 per cent (excluding counties' funding), Rwanda, 18.8 per cent, Tanzania 4.9 per cent and Uganda 4.5 per cent. Rwanda had the highest score - of 6.1 - on Agricultural Transformation in Africa, and is the 2017 best-performing country in implementing the Malabo Declaration. Three other countries - Djibouti, Sudan and Tanzania - are not on track. "One of major problems to farmers is the inadequate number of extension officers," she told The Citizen recently. During this time, the cost of transporting a 100-kilo bag of onions from the farm to the market, 40 kilometres away, is Sh7,000, up from Sh3,000 during the dry season. Surprisingly, farmers pay the same price - Sh7000 - to transport a 100-kilo bag of onions from Singida market to Kariakoo in Dar es Salaam. "If policy-makers comprehend the complexity of the challenges surrounding agriculture, then the manner of doing things won't be business as usual. "Farmers face immense challenges and we will continue carrying out a campaign for policy-makers to become aware of the situation and tackle such problems." "If the budget is unsatisfactory," she points out, "then the provision of loans to women can alleviate the situation and improve the performance of agriculture." 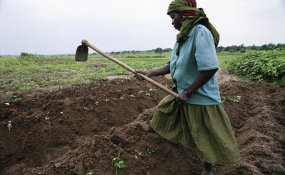 ActionAid Tanzania's project manager for Dodoma and Singida regions, Mr Elias Mtinda, says the decision was motivated by the fact that a great number of women in Tanzania are farmers. "We chose to intervene and it has worked," he says. "People are now able to make follow-ups on various government-funded projects while questioning their delays and how the money is used." Ms Chibuti agrees that she has become knowledgeable about public financing in agriculture and has been able to question the government's response on the issue. That impresses Singida Municipal Council's agriculture, irrigation and cooperative officer, Mr Abel Mngale, who says the citizens' understanding of public financing on various projects eases the authorities' burden. "For example, we have 84 villages. Now if we don't have additional 'eyes' of looking at our projects, their sustainability can be compromised."